Jainism is an ancient religion with its origins in India. Pacifism and compassion are central tenets of the Jain following and it is these elements that have greatly influenced Eastern mysticism for several millennia. The Jainists believe that divine truth is communicated on Earth by ‘Tirthankars’ who communicate otherworldly knowledge to other humans. Tirthankars appear in groups of 24 there lives following in succession. 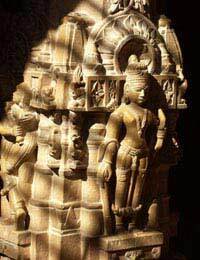 The 24th Tirthankar to have existed in our realm, ‘Lord Vardhaman’, died in 527 B.C. However, the Jains believe that their will be an ongoing succession of Tirthankars across time and space. For this reason, they do not worship Lord Varhaman, or any of the 23 Tirthankars that preceded him, as such, but rather follow the virtues that they taught through example. The Jainists believe that all humans have an eternal soul (or ‘Jina’) that is capable of reaching spiritual Enlightenment or ‘Moksha’, by living a spiritual life that is strict and based principally around the virtue of respect for all living forms. Like Buddhists and Hindus, Jainists believe in ‘Karma’ - the notion that all your actions will come back to you; hence their desire to lead a life that is humble and free of aggression towards others. Jainists follow a strict ethical code prohibiting violence, dishonesty, stealing, promiscuousness and possessiveness. Jains pray daily, reciting the ‘Navkar Mantra’ which reinforces the true path to becoming a ‘Siddha’, or Enlightened person, via the principles outlined above, and through an official commitment to the Jainist way of life by becoming a nun or monk. This Navkar Mantra is undoubtedly similar in form to other forms of meditation, and can be recited by Jainists at any point of the day for as long as they wish. The Jains are divided into two main sects; the Digambars and the Shevtambars both of whose teachings may be unpalatable for those committed to living and working the Western world. Whilst Digambars do not believe in wearing clothes, as they are a worldly possession, Shevtambars do not believe that women can attain spiritual Enlightenment. The extremity of such views clearly does not invite a half hearted commitment and, as such, Jainism is not perhaps the ideal form of spiritual practice for most Westerners. However, the principles of pacifism, honesty and respect have caught on and influenced many other spiritual groups and it is perhaps these facets that have led to the unlikely rising popularity of Jainism in The U.S. and the U.K. Although there are clear parallels between Jainists and Buddhists, including their desire for spiritual Enlightenment and their teaching of compassion for all beings, Jainism is principally and ascetic religion that believes in attaining Enlightenment through self denial. It was in opposition to this belief that Siddhartha Gautama meditated and attained his Enlightenment. For this reason, meditation is clearly not the central pillar of Jainist practice. However, meditation is practiced by Jainists across the many diverse subdivisions of both the Digembar and Shevtambar schools and was heavily practiced by Lord Mahivir, one of the 24 Tirthankars. Jainist meditation focuses on emptying the mind in order to better realise truth and is often also focused around denial. Mahivir often meditated outside with no clothes for warmth, and sometimes meditated standing up. This kind of meditation is subject to leading the practitioner down an unhelpful path as the pain associated with asceticism can be sought as an end in itself and is quite at odds with the prevailing instinct in our society. Jainism may well suit some individuals, the path to Enlightenment being a personal road; however, due to its severity and strictness, most of what can be gleaned from it may be best found elsewhere, whilst specific Jainist mantra’s can be easily recited where they are felt to be helpful.